Since 2002, members of our group have been studying the ecology and conservation of birds in tidal marshes. 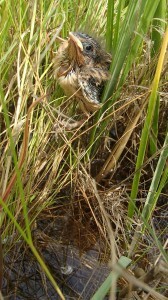 Initially, the focus was on saltmarsh sparrows at study sites along the Connecticut coast of Long Island Sound. Over time the scope has grown and we now work on a variety of species in marshes all along the US Atlantic Coast and are increasingly studying changes in the vegetation as well. Much of our work on this topic is now conducted as part of a large collaboration involving researchers at several institutions: the Saltmarsh Habitat and Avian Research Program (SHARP). To learn more about this collaboration, visit the SHARP web site at http://www.tidalmarshbirds.org/. Our work on tidal marsh birds is currently centered on several main projects. The conservation of tidal marsh birds: Guiding action at the intersection of our changing land and seascapes. This project has two parts. First, there is a large survey component designed to describe and understand the distribution and abundance of tidal marsh dependent birds in salt marshes from Virginia to Maine. At ~1700 points throughout this region we are collecting data on birds and their habitat. A subset of these sites have historical data that will also be used to measure population change. Second, we are studying the demography of several tidal marsh species at multiple sites between New Jersey and Maine. Much of the work on this project is being conducted through the SHARP collaboration, with graduate students at 5 different institutions responsible for different pieces of the study. Funding comes from the US Fish and Wildlife Service, with matching funds from many partners. More information here. Sentinels of climate change: Coastal indicators of wildlife and ecosystem change in Long Island Sound. This project combines the analysis of historical data with the collection of baseline information in order to assess how climate change is affecting habitats along the shore of Long Island Sound. Funding comes from the Long Island Sound Study through the Connecticut Department of Energy and Environmental Protection. Initial results here. Ecological resistance of multiply stressed populations: short-term responses of tidal marsh birds and plants to Hurricane Sandy. For this project we resurveyed birds and vegetation in 2013 at sites where we had collected data in 2011-12, in order to test theoretical ideas about the ways that ecosystems respond to major natural disturbances. This work is funded by the National Science Foundation and the US Fish and Wildlife Service. More information here. Resilience of the tidal marsh bird and plant communities to Hurricane Sandy and assessment of restoration efforts. This project builds on our earlier work as part of the SHARP collaboration and is designed to do two things. First, it will extend our NSF project (above) and lay the ground work for assessing the longer-term responses of tidal marshes to hurricanes and anthropogenic stressors. Second, it will enable us to track the consequences of restoration work that is planned in response to Hurricane Sandy. This work is funded by the US Fish and Wildlife Service. Human dimensions of LIS ecosystems: an evidence-based socio-ecological model for education and management. This project aims to investigate two problems associated with human responses to sea-level rise and tidal marsh loss. First, we plan to investigate the willingness of coastal landowners to participate in different types of conservation actions that will facilitate marsh transgression into the uplands. Second, we will investigate the influence that educational information has on attitudes about coastal protection. This work was designed by Chris Field as part of his PhD, and also involves collaboration with Ashley Dayer. The project is funded by Connecticut Sea Grant. Behavior and life history of tidal marsh birds. Although much of our work has an applied focus we are also studying the basic biology of the birds that use coastal marshes. Currently, we are especially focused on (i) understanding the links between different parts of the life cycle (breeding, moult, migration, and overwintering) of saltmarsh and seaside sparrows and (ii) in better understanding the factors that influence the unusual mating system of saltmarsh sparrows. These projects are currently led by Alyssa Borowske and Emma Shelly, respectively, as part of their PhDs and are funded by National Science Foundation Graduate Research Fellowships. 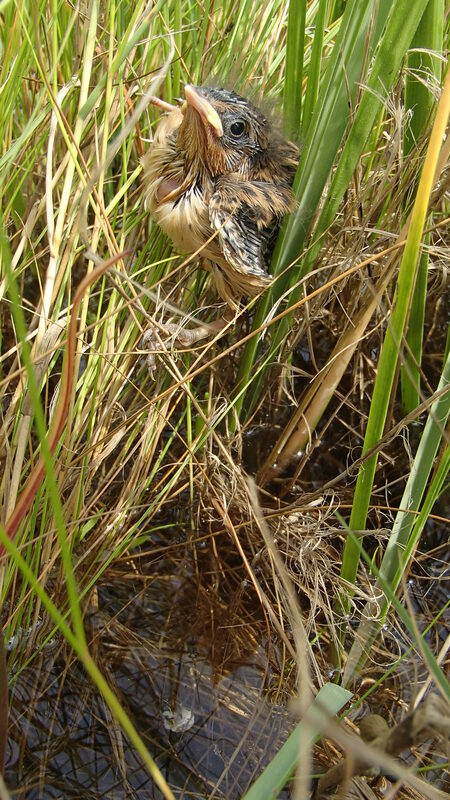 Photo credits: Saltmarsh sparrow nestling, forced to climb out of its nest (which is submerged) during a high tide. © Photo taken by Alyssa Borowske and can be used only after first obtaining her permission.